Allston-Brighton has historically been the epicenter of college life in Greater Boston, but the city's commercial developers have gravitated to the two neighborhoods, building luxury condos and apartments where college students still dominate the landscape. 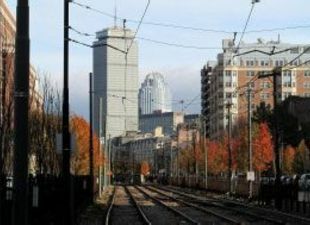 The two neighborhoods have historically been viewed as the place to find a cheap apartment while class is in session, but Boston’s exploding property values are giving developers reason to explore a new multifamily approach outside previous emerging housing markets in the region. The Lancaster, a 55-unit condo development at 1501 Commonwealth Ave., opened in 2015. Although mid-$400Ks starting prices were mentioned in early marketing, the project’s initial listings ranged from $535K to $800K, averaging out to the $700s per SF. Prices at the Aberdeen at 1650 Commonwealth Ave. are even in the $900s per SF and crest over $1K. There has been a rise of commercial development in the neighborhood like Boston Landing and Harvard’s continued Allston expansion. Harvard’s development has fostered several innovation labs and many predict it will become Boston’s next life science hub. These real estate plays have developers realizing more people are sticking around Allston and Brighton after graduation. Increasingly they could be looking to buy a home; nationwide homeownership rates have shot up so far in 2017. “Now what you’re seeing is there’s a proven market, a lot more projects are titled as condos, or larger projects incorporate condos,” Vineburgh said. Those who are normally used to pizza joints and rock clubs with cheap drinks in Allston Village might balk at the new living standard, but Vineburgh said it is possible for the two styles to coexist. The new Allston-Brighton normal might seem costly, but it is still more affordable than other parts of the city. One developer sees that as an opportunity. At 92, Brown has made deals for decades as the city has become increasingly attractive to foreign buyers. Even if he is one of the largest landlords in the city, he is still shocked by today's prices. Brown’s company built 112 units in Packard’s Corner in the 1970s for $20K a unit. Today, he said, the same type of building costs a developer around $450K a unit when hard and soft costs are factored in. He added he recently looked at a six-unit building in Somerville where he would normally expect each unit to go for $150K to $200K per unit. The owner was asking $650K each. Brown is doing the opposite with his own properties in Allston and Brighton. The Hamilton Co. broke ground in September on workforce housing at 79-83 Gardner St. The phased project will ultimately bring 200 affordable units to the neighborhood and include the same level of amenities normally associated with the Seaport’s glitzy new towers, only Hamilton’s will cost about 30% less. Brown is bullish on Brighton and Allston’s role in the “new Boston,” but he still thinks the city is destined for a correction. All parties have to end sometime, and he views the fact that so many new luxury towers are offering several months of free rent as an early sign of a downturn. To hear Vineburgh, Brown and other panelists discuss what are Boston's next hot neighborhoods, join us Nov. 30 at Bisnow's Boston Emerging Markets event at the Westin Copley Place.